One day sage Naradhar visited the Lord Shiva and his family at Mount Kailash. As a token of love he gave Lord Shiva one special fruit. The fruit was called as the Fruit of Wisdom. Now there was only one fruit but Lord Shiva's two sons - Ganesh and Karthikeyan - were there. 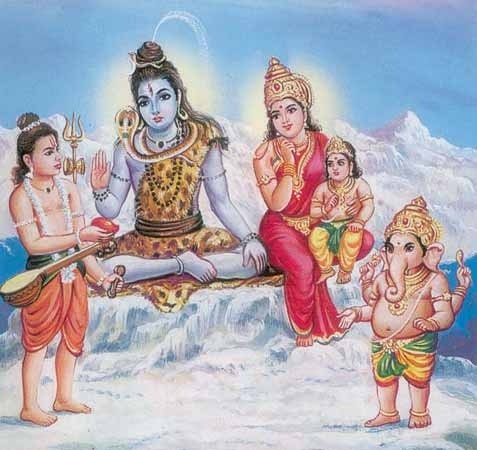 Shiva and Parvathi were confused about whom to give that one fruit of wisdom. Lord Shiva thought about a plan. He said, "Who among you both would go three times around the world and return back first will get this special fruit of wisdom." Soon after hearing this Lord Karthikeyan sat on his peacock and started his trip around the world. But Lord Ganesh started walking around his parents - Shiva and Parvathi. Both Shiva and Parvathi were surprised to see what Lord Ganesh was doing. They asked him why he was doing this instead of racing with his brother. Lord Ganesh replied," Dear parents, you both are the world to me. That is why I am going around you." Shiva and Parvathi were impressed by the smartness of Lord Ganesh. So they offered the fruit of wistom to Lord Ganesh. Later when Lord Karthikeyan came to know about this, he became very angry and left Kailash. He went and sat in a mountain in South India called as Pazhani hills. This incident was a trick played by Lord Shiva and Sage Naradhar to create the special religious place Pazhani for Lord Karthikeyan.